Upon reading the above-quoted press release several questions popped in my head, and I reached out to them to interview the company’s CEO, Lori Weiman. Today I’d like to bring you that interview: Geno: The press release said that your results are based on “the compliance level of all affiliates found advertising across The Search Monitor community.” Could you please elaborate a bit more on whose behavior exactly was analyzed? Were these affiliates in the programs of The Search Monitor’s clients (i.e. those that use your services to monitor paid search compliance)? Lori: The data was pulled from all affiliates found advertising across all keywords that we monitor for both clients and non-clients. The Search Monitor monitors millions of keywords. Geno: Ok. But to get a feel of how representative (of all affiliates that utilize paid search) your sample is/was, could you please also provide AM Navigator’s readers with (i) the total number of paid search affiliates analyzed by you for the above-quoted study, and (ii) your estimate of the total number of affiliates employing paid search? Lori: While the exact number of affiliates is proprietary, we can tell you that it is a number well north of 10,000. 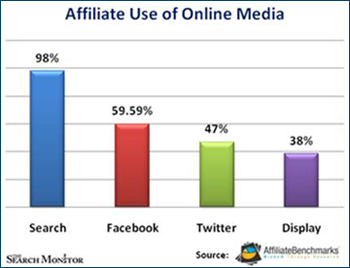 We don’t know the total number of affiliates employing paid search, but the percent can be found from the Affiliate Benchmarks annual survey — 2012 data is below with 98% of affiliates reporting that they use paid search. What is a good conversion rate from impressions to click to identify good quality affiliates?